Purim is the holiday celebrating a time when the Jewish people living in the ancient Persian Empire were delivered from extermination. Today, it is a day of joy for adults, and fun activities for children. Gifts of food are sent to friends, money is given to those less fortunate and children dress up in costumes. Plus, food traditions center around Hamantashen (filled-pocket cookie recognizable for its triangular shape) is eaten and adults have a feast with an emphasis on including drinking wine. While the celebrations may seem superficially self-indulgent, there are deeper meanings that can help you apply some thoughtful lessons to your everyday life. On the surface the Purim story seems to be a series of natural events and coincidences. Even God’s name is not mentioned in the Biblical Book of Esther. But the story of Purim reveals that Divine Providence was constantly guiding events behind the scenes, meaning that the deliverance of the Jewish people is masked. It is a story wrapped in disguise, as if hidden behind costumes and masks. We can apply this perspective to our everyday lives. Sometimes we are fortunate to see how things worked out for the best when we look back at our past experiences. But often we may not understand why things turn out a certain way, even against our best efforts. However, with the insight of Purim, we can begin to unmask the miracles that happen to us every day. Although the journey is often hidden, there is a hidden purpose and plan. Maimonides (1135-1204) writes: “What is the obligation of the [Purim] feast? That one should eat meat … and drink wine until one falls asleep.” Let me clarify: The point is not to get drunk and act irresponsibly. Getting a little tipsy is meant to enhance the emotional and spiritual experience. The reigns of the mind and intellect are loosened so that our emotions can be expressed more freely. This can also fit the theme of unmasking reality. We are internalizing the belief that it is not our intellects or logic, which guides our lives’, and letting go of the illusion that we can control everything. 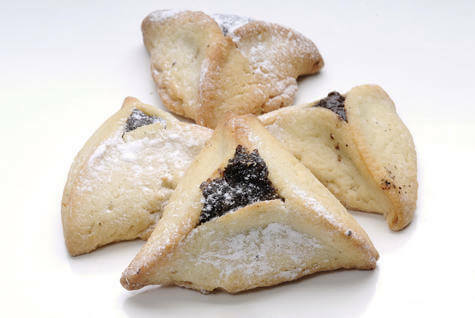 Who doesn’t like eating hamantashen, whether it is jelly or chocolate filled? But it is more than just a treat. This symbolizes the hidden miracles of Purim. In the story of Purim, there were no open miracles, just a seemingly natural sequence of events. Only at the end of the story is it revealed that a miracle occurred. The outside of the hamantash is simply dough, but the delicious filling is hidden inside. Our lives and experiences often seem haphazard and coincidental. The hamantash reminds us that nothing is random and there is a purpose. One of Purim’s primary themes is unity. So on Purim day, we place special emphasis on caring for the less fortunate. Maimonides wrote that we should not be judgmental or discriminating in selecting the recipients of these Purim gifts. Instead, one should give to whoever stretches out his hand. The less fortunate certainly benefit from our generosity but wet—he givers—also benefit. Through uncalculated acts of kindness, we truly improve our character and become more positive and generous. On Purim, sending gifts of food to friends emphasizes the importance of friendship and community. The purpose is to increase love and friendship. It is also a wonderful opportunity to repair broken relationships by sending gifts to old friends that you may have fallen out with or not seen in a while. Holding in negative feelings, ultimately harms you even more. Sometimes it just takes making the first move. As long as you do your part, you don’t need to carry unhealthy emotional feelings. Healthy emotions and positive perceptions are central to theme of Purim. Although the day is filled with fun activities, they are designed to exercise emotional wellbeing and positive mind habits. Friendships are enhanced and repaired, and a positive perception of life’s challenges is exercised. Let us take away these insights and apply them throughout the year. L’Chaim! Cheers!